Tatooine rests in the Tatoo System, located in the distant Outer Rim, beyond the reaches of the New Republic. Poor, with very little industry to boast, Tatooine is a mixture of hard-working locals attempting to extract a living from the unforgiving environment and transients visiting the world for illegal ventures. Historically controlled by the Hutts and spice traders, their shady operations bring many spacers, bounty hunters, thieves and other malcontents to the planet's few port cities. In the last few decades, however, the planet has seen various governments come and go, earning a reputation for fiercely defending its anarchy. 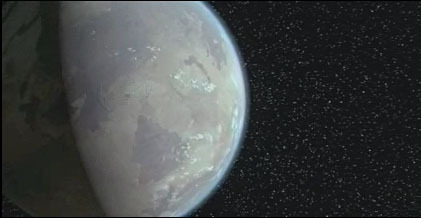 The planet is technically owned by the Hutt Clan, but they have not exercised any influence over the planet, making their ownership completely moot. Two years ago a strange type of massive sandworm was introduced into the wild, and has adapted into the current climate rather well. Sporadic colonization attempts have resulted in scattered communities separated by vast gulfs of wilderness. On the edge of the Dune Sea is Mos Eisley, arguably Tatooine's busiest port during the time of the Empire. Not too far away are Mos Espa, Anchorhead, and Bestine City-State. If not involved in Hutt business, most colonists on the planet eke out a meager existence as moisture farmers. Small homesteads employ devices called moisture vaporators to tug what little water vapor is suspended in Tatooine's air. This moisture is then used to irrigate underground crops or is sold directly to interested parties. Lately, the discovery of the spice Melange in the soil of the deep desert has influenced Tatooine's resident population to the point where a large number of previously unemployed settlers now work for the Harkonnens. Tatooine has been by and large a self-autonomous colony for over four thousand years, originally founded in part by Czerka. As such, many of it's 'city states,' such as Bestine, Mos Espa, and Anchorhead, work in tandem and largely see themselves as one body. There was, for a while, talk of Bestine breaking away from this unofficial alliance, though it never happened. Due to the Route of Ages proximity, the planet has exchanged hands a number of times in the last five years. While still ostensibly owned by the Hutts, their presence has waned, and forces such as the Harkonnens, the Tragolite Federation, Imperial Remnant and even Peacekeepers have matched wits with the Hutts and constantly vye for power over the planet's sovereignity. In 22 ABY, the Harkonnen's officially took over the planet, though they were forced out by the Cylons, who were destroyed by Captain Zon Huntreas. This left the planet, politically, back at square one - on paper, owned by the Hutts, but without any Hutt presence or protection. There have been several militia groups formed in response to these threats, the most famous being the now-defunct GWAM (Generally Wellness Alliance of Mos Eisley), the covert operations group Ion Storm (status currently unknown). While not a militia, an organization known as the Kukai Foundation was founded in response to the war with the Harkonnens. They are a neutral organization dedicated to helping the planet in a peaceful fashion. There are two colony-cities, Larkin and Neumann, which are under control of the [[Outer Rim Republic]]. They are located in the Dune Sea. In the summer of 22 ABY, a group known as the Protoss unofficially annexed the planet to set up mining operations. This situation is ongoing. The planet Tatooine has three natural satellites, two of which have been sites of failed colonies. In fact, many attempts to colonize the space around Tatooine have been met with disaster, including the PLANT Allied Council, a force of some 30 O'Neill cylinders which were wiped out with a fold-space weapon during an incident known as the Midnight Massacre. The Harkonnen's built the Olympus Station, but it too was destroyed in battle. The only currently remaining colony in orbit belongs to the Kukai Foundation. Anchorhead was destroyed due to a malfunctioning Tragolite atomic reactor which went critical. While they attempted to blame the attack on their political enemies (namely, Wolfram and Hart), their proof was never found and Anchorhead was rebuilt. Ever since the discovery of the Route of the Ages, Tatooine has become something of a galactic hotspot, with many more colonists arriving and setting up smaller communities in the the habitable regions. The Sandpeople have been known to raid these communities, and many farming outposts vanish overnight. While not known to the general public, the Tragolite Federation have an astounding number of military bases hidden miles beneath the surface.